Following their invasion and occupation of many areas of Earth during the One Year War, the Principality of Zeon military begins developing amphibious mobile suits to increase its war capabilities in Earth's oceans and waterways. One of their earliest designs is the MSM-03 Gogg, and while being their first truly successful amphibious design, it has its limitations. 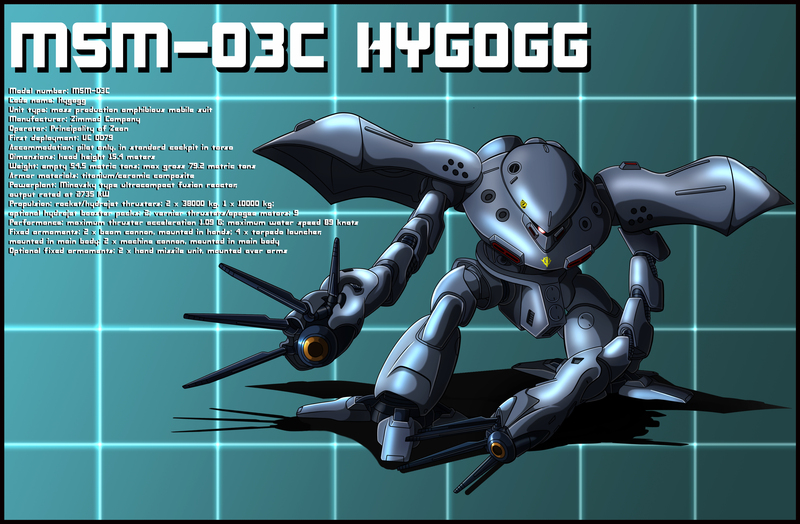 To overcome these, the improved MSM-03C Hygogg is developed, and it differs quite a bit from its predecessor in both appearance and abilities. Its outer form is refined, making it more streamlined and increasing its water movement speed. The mega particle guns mounted in the original Gogg's stomach is moved into the Hygogg's hands, allowing for much greater flexibility in its attacks. The Hygogg can also mount a large "hand missile unit" over each arm, equipped with a set of blow-away panels to protect the mobile suit from the blast of the rather large and heavy missile when launched. Only a limited number of these experimental units are built, with three units operated by Zeon's Cyclops Team special forces unit in a raid on the Earth Federation Forces' Arctic base in December UC 0079.